Home » Hobby News » Hobby News - Gamers Give Charity Auctions 2 New Sneak Peeks! Hobby News - Gamers Give Charity Auctions 2 New Sneak Peeks! I Just had to copy this article over from Gifts of Mork, (visit them and find out what they are all about) you need to see these items up for Charity Auction soon. Gift of Mork are very excited to bring you this Sneak Peek at some fantastic models that will be going under the hammer for charity on 23rd of September during our Gamers Give eBay Charity Auction event. Feast your eyes on these wonderfully painted minis that you could not only bid on and own, but could also help raise some much needed funds for charity. First up is a fantastically pro-painted The Sanguinor, Exemplar of the Host. 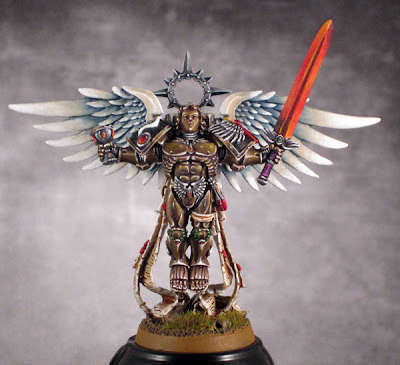 The artist that painted this NMM (Non-Metallic Metal Paint) Sanguinor, which can be seen in the 40kforums banner, says "think it would be cool that something so present on the site is used to support Gifts of Mork" and we agree with him, especially as 40kforums was the birth place and original home of Gifts of Mork..